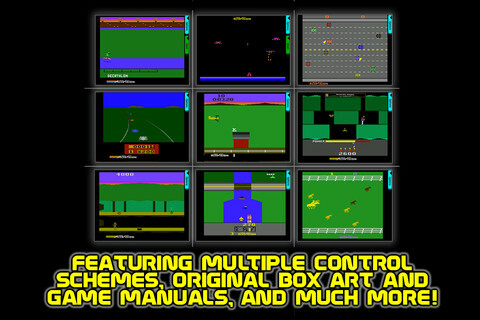 Developer Quote: "This one-of-a-kind compilation, Activision Anthology offers the entire Activision 2600 catalog in one app, with controls designed and optimized for each game." • Access to 45 classic Activision and Imagic games including PITFALL, RIVER RAID, THE ACTIVISION® DECATHLON, BARNSTORMING™, STAMPEDE™, PITFALL II, ENDURO™, DEMON ATTACK, and many more! • Enjoy full Game Center integration including leaderboards and achievements! • Compatible with the iCade© gaming cabinet! • Buy once, play any time! Go ahead and immerse yourself in the fun of retro gaming as you enjoy this special collection. When you download Activision® Anthology you will also receive the classic hit KABOOM!™ FREE. But that's not all! Also, collect up to 45 classic Activision® and Imagic games! Is this a deal or what? Don't miss out on this classic gaming fun while it's free! COOL CONCLUSION: Activision Anthology provides the best of retro gaming entertainment to bring back the good old days with loads of authentic titles and special controls for each game! --iOS/Age Rating: This app requires iOS 4.3 or later. Rated 9+. --Developer: Activision Compatible with iPhone 3GS, iPhone 4, iPhone 4S, iPod touch (3rd generation), iPod touch (4th generation) and iPad.